CHLORINE in tap water and pesticides in food are making people prone to food allergies. A US study has found that dichlorophenol, a chlorine-containing chemical, can trigger allergies to food items, ranging from milk to cucumber. Published in December in Annals of Allergy, Asthma and Immunology, the study identifies chlorinated drinking water and pesticide-treated fruits and vegetables as the main sources of this chemical. People can also get exposed to it through mothballs and cleaning material in urinals. Jerschow and her colleagues included 2,211 participants from 2005-2006 US National Health and Nutrition Examination Survey in their study. Of these, 411 were allergic to specific foods like shrimps or peanuts and 1,016 to environmental contaminants like cat and dog hair. The participants were made to fill a questionnaire about their pesticide exposure in seven days prior to the study and their urine was tested for dichlorophenol. The researchers found that in the urine of participants with allergies, the level of the breakdown products of two dichlorophenol-based pesticides were as high as 2.9 mg/l and 53.7 mg/l. According to the US Environmental Protection Agency, permissible limits of these pesticides, 2,4-dichlorophenoxyacetic acid and 1,4-dichlorobenzene, in drinking water is 0.07 mg/l and 0.075 mg/l respectively. Those participants also had very high levels of Immunoglobulin E (IgE) in their blood. These are antibodies found in mammals to fight infections and allergies. People with allergies typically have IgE levels of 0.35 kilo units per litre or higher. 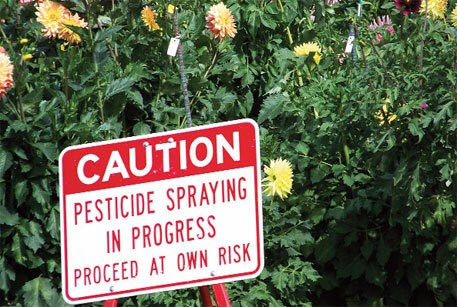 Previous studies have linked occupational exposure to pesticides with allergies. Jane Hoppin of the National Institute of Environmental Health Sciences, North Carolina, US, published an article in 2009 that showed farmers who use pesticides in their fields are at a high risk of asthma, including allergic asthma. Much earlier in 1998, Wilmun Dong had found that when rats are exposed to an insecticide, carbaryl, they become prone to allergies. Jerschow’s study suggests that allergies can stem not only from occupational exposure to pesticides but also through consumption of food products that contain such chemicals. While the study cites chlorinated tap water as a primary source of dichlorophenol, Jerschow clarifies that one cannot completely rely on bottled water either since various studies have found pesticides in that as well. Using alternative methods of water treatment like ozone and UV light might be the best way to avoid allergies. “I agree with the findings. It surprises me that pesticides are used to treat water. Temephos, which is used to prevent mosquito breeding, has deleterious effects on humans. While the concentration in which it is used is low, its use is still not justified,” says Om Rupela, former principal scientist at the International Crop Research Institute of Semi-Arid Tropics in Patancheru, Andhra Pradesh. At present, however, the link between pesticides and allergies remains associational and “prospective studies on evaluation of the causal relationship would be required,” notes Jerschow. Hoppin says future studies should also focus on pesticide exposure before people developed the allergic tendencies. This is a shockingly irresponsible article. To suggest that "CHLORINE in tap water ... (is) making people prone to food allergies" is playing into the hands of commercial vendors of bottled water who denigrate public supplies to boost demand for their products. Dichlorophenol is not used for drinking water purification. It is a pesticide and if it is found in drinking water, it is the result of pollution from agriculture and should be controlled at source. Chlorine for water disinfection has made a major contribution to public health. Unfortunately, many private businesses would like to scare people about its use so that they can promote their own more expensive and less effective products. CSE should not be helping them! Our sources of water are contaminated and microorganisms that cause severe health problems are aplenty. If such water is not chlorinated, people would die in millions due to such diseases. If chlorinated water is passed through activated carbon, chlorine and its derivatives are effectively removed and the water quality improves. You should therefore propagate such simple techniques instead of blaming chlorine. The article flags that metabolites of chlorine are harmful to health and provide some evidence for the same. Why do we need to choose between water that is contaminated with disease causing microbes and water that is laced with toxins? There is evidence that both are harmful. If we want safe drinking water, it is crucial that we look critically at evidence that suggests that chlorine may not be as benign as believed. As already stated in the original paper and this article, there are indeed multiple associational factors which seem to be playing a role in increased sensitization to allergies. Along with drinking of chlorinated water, population exposure to dichlorophenols could come from contact with pesticide-sprayed vegetables and breathing of contaminated air amongst others. Dichlorophenol gets generated as an intermediate breakdown product from various herbicides and surface water pollutants, and might find its way into the air that we breathe or the water that we drink. The Jerschow et al. paper mentions that 2,4 dichlorophenoxyacetic acid is formed as a byproduct of chlorination processes involving water treatment, and it then degrades to 2,4- dichlorophenol in the environment. As mentioned in the article, Jerschow is equally skeptical of chlorinated drinking water and bottled water. Allergic reactions happen, when a personÃ”Ã‡Ã–s immune system being hypersensitive, erratically responds to an otherwise innocuous substance, called the allergen. The influential Ã”Ã‡Â£hygiene hypothesisÃ”Ã‡Ã˜ states that an early childhood exposure to a rich microbial world of flora and fauna including infectious agents and parasites may serve as protection against allergy. In line with such a hypothesis, the Jerschow paper suggests that dichlorophenol-containing pesticides might be altering the microbial spectrum that humans are naturally exposed to which is then inhibiting their ability to cope with allergies. So, one is not interrogating the efficacy of chlorine in killing harmful microorganisms but questioning whether chlorinated water and pesticides are not wiping out beneficial microflora due to their antiseptic action. The issues raised in the paper do not indict chlorine but seem to suggest a need to understand "what/how/whether" particular levels of chlorine and chlorine-containing pesticides under specific conditions for reactions can potentially make us less or more susceptible to allergies. There seems to be a need for balance, not dismissal Ã”Ã‡Ã´ for caution, not panic.